When you decide to purchase a new Mercedes-Benz, why would you accept anything less than the complete luxury experience? With the European Delivery Program, you get to experience the full extent of your new Mercedes-Benz right at its birthplace. The European Delivery Program not only gives you the perfect way to enjoy your new Mercedes-Benz, you can also save up to 7% on your vehicle’s MSRP*, depending on the model (discounts vary, not all models are included, and not all models are available). We have an extensive network of vehicle drop-off points that are ready to prepare your new Mercedes-Benz vehicle for its delivery to the United States. This drop-off point network allows you the flexibility to enjoy the best of Germany and European cultural centers without having to go off the beaten path to bring your experience to a close. Vehicle drop-off in Italy is subject to prior arrangements and an additional charge, payable to BLG. Rate information is available upon request. Cars are driven to Munich for truck transfer to port of loading. Car registration and insurance must be valid for at least five days after drop-off. Are non-U.S. specification vehicles available for purchase through the European Delivery Program? Only U.S.-spec vehicles are available for purchase from Mercedes-Benz USA. Is it possible to cancel a European Delivery Program order? Yes, but there is a $200 cancellation fee. Do I need an International Driver’s License to drive in Europe? An International Driver’s License is only required if you travel through Austria, Switzerland or Italy. Your vehicle will also require a sticker for travel on those roadways, and this sticker can be purchased at gas stations in Germany and at the borders. International Driver’s Licenses can be obtained at AAA locations in the United States. Will I need toll stickers? Toll stickers are required on all vehicles in Austria, Switzerland, and Italy’s highways. Many hotels in Europe charge more per additional person, although the rates depend on the hotel. 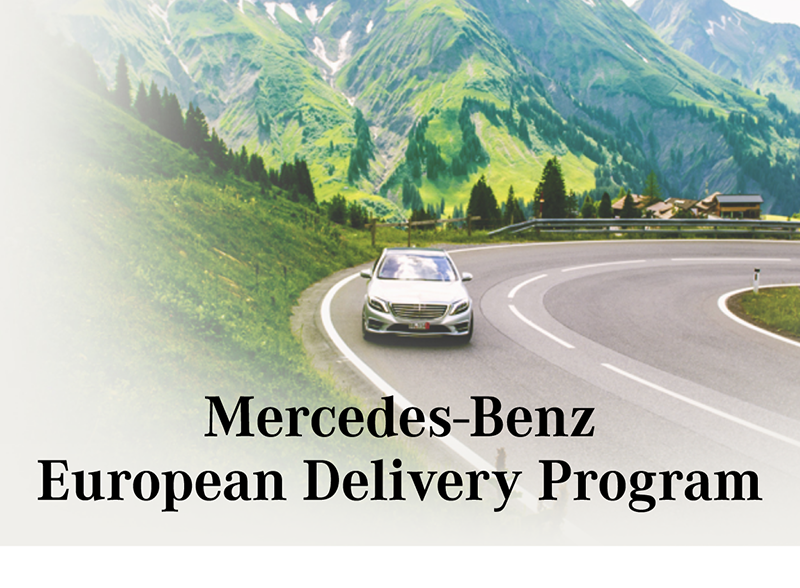 If you have any other questions regarding the European Delivery Program, please contact us at (855) 780-1053 or visit Mercedes-Benz USA’s website here.